This article was provided to BluePearl by Royal Canin, a BluePearl Partner in Education. Often, the presence of multiple problems complicates diet selection because there isn’t a diet that fits the nutritional profile needed for management of both diseases. 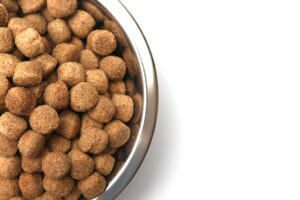 For example, how do we choose the best diet for a dog that has both chronic pancreatitis and inflammatory bowel disease or even food allergies? Where do you turn if that same patient no longer finds his low-fat diet palatable? The good news is there are options for the veterinarian and the patient! Ideally, percentage of ME is a more accurate way to compare different foods since it allows comparisons despite differing amounts of moisture, fiber and ash. It is important to note that not all therapeutic diets marketed for the management of gastrointestinal disorders are the same, and they vary greatly in fat content. And of course, it is all relative to the patient’s original diet. For acute pancreatitis, a metabolizable energy (ME) of 20% or less is recommended. However, for more chronic pancreatitis a diet that is consistent and moderately low in fat is key. See below for some Royal Canin options for your patients. Royal Canin is a BluePearl Partner in Education.